Normally when we think of web scams, we think of the junk we receive in our emails, or those Facebook messages where a “friend” is in England and needs you to wire cash to them. But website deceit can show up in your regular mail box too. And there are similarities that seem to run through them all. They have your account information, which makes it seem like they know about your situation and are just looking out for your best interest. But if you don’t fill out their papers and send them payment, you could lose your entire Internet presence. Notice the letter has an official-looking logo (which anyone and their dog can get). The language may either sound professional and official, or it may be awkwardly written as if they are not very adept at the English language (that’s a huge clue). 4. It demands that you act fast. Whenever someone tries to make you act fast, SLOW DOWN! They are trying to get you to act without fulling thinking this through. 5. It looks like a bill and asks for payment. While it is true that you could lose your domain if you don’t renew it on time, you shouldn’t do it through these shysters! Stick with your original company. They are the only ones that will send you notification with their name/logo on it whether it’s in hard mail or over email. So for example, a client received the letter below in her mail box. A hard letter (or snail mail if you will) from a company called iDNS. They are known for misleading and unethical methods to get people’s money. This particular type of letter is called “Domain Slamming.” The intent is to get you to move your domain over to them and pay a lot more money. Click this image for larger view. You’ll see that I highlighted some key areas to notice. When you first take this letter out of the envelope, it looks like a straight up bill. 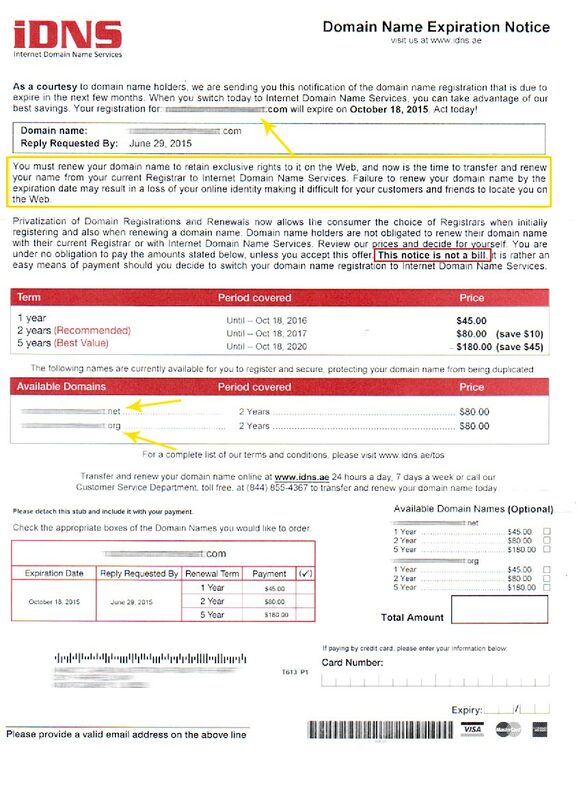 Like, if you don’t pay this bill your domain will expire. It will also note any other domains you own for the same website. By the way, all this information is public unless you privatize it. It does mention transferring your domain over to them, but many people won’t see that right away. Especially for those who are less Internet savvy; they won’t understand what this letter is saying. Luckily, my client called me when she received this letter wondering if she needed to pay it. I was able to warn her off. I had another client who called about a different document she received in the mail; she said she almost sent them a check, but then thought to ask me first. Good thing! If you were to pay them what would happen? Your domain would be transferred away from your original registrar (Godaddy, Dreamhost, Name.com, etc.) to iDNS. And honestly, I’m not sure what happens at that point. I do know that their business is located in some obscure little island country. The letter has a New Jersey address but that is actually a UPS box. They are not registered to do business in that state. You will easily be paying triple or more your current price. Domains can cost anywhere from $2-$20 per year. But iDNS will charge you $45 per year! And after you transfer your domain, I’m guessing it may be difficult to transfer it back to your trusted company. 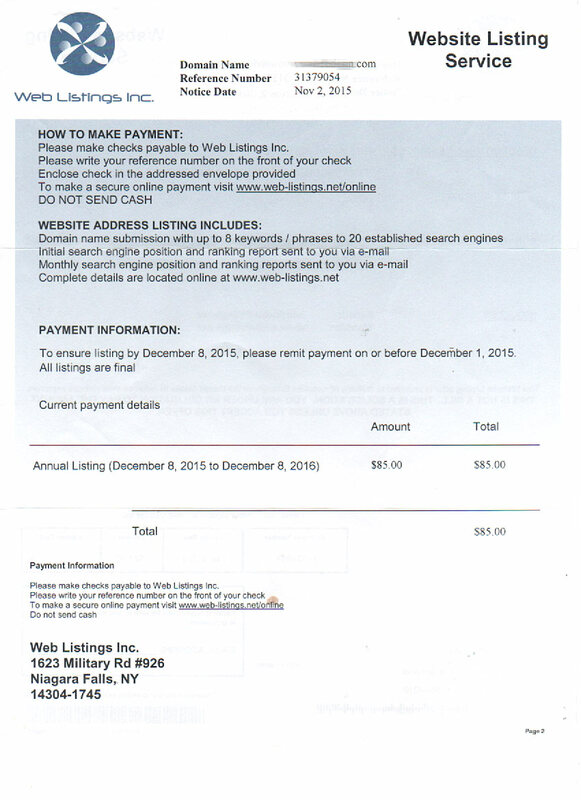 Here’s another “bill” that came in the mail from a company called Web Listings, Inc. It’s not quite as blatant, but it still comes across as an invoice that you must pay. 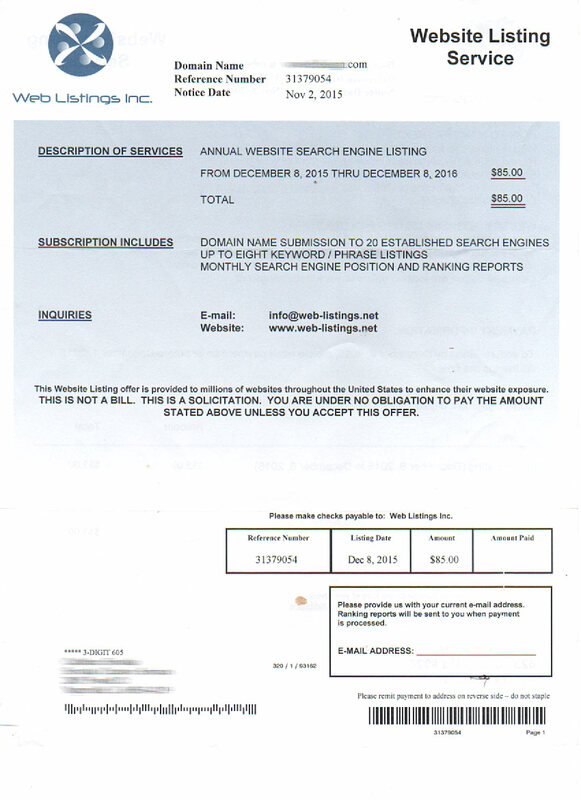 This one is not domain slamming, but offers bogus website listing services to help with your search engine rankings – in the form of what looks like an invoice you must pay. They claim they will submit your domain to 20 established search engines, up to 8 keyword/phrases, and monthly reports. Our file contains complaints from consumers who report that the company’s invoice is misleading because it looks like a bill. In February 2015 BBB requested that Web Listings Inc. provide substantiation that their solicitation was not misleading along with contact information for 10 consumer references. Web Listings Inc. did not respond to this request. First… 20 established search engines? Let’s face it; can you name more than three or four? This is such a vague statement. What key phrases? For which pages? How do they propose to do this? If they want to put phrases in your web pages you would have to give them access. But the fact is, they have no intention of helping you with your Search Engine Optimization. How Do I Prevent This Scam From Affecting Me? I suggest that you save every email and snail mail from your domain registrar and hosting company in a folder. Also, log into your account periodically to make sure the next update pricing is in line with what you have been paying. If your domain registrar sends notification that it’s time for renewal, they will email you, and sometimes snail mail you, but it will have their company logo and look, and the language will feel right. To be safe, just call them from a number you already have for them, or from their official website and ask about any communications you receive that seems suspicious. If you want to renew your domain, go directly to the website (i.e., Siteground, Bluehost, Godaddy, etc.) and access your account directly. Anything that looks like an invoice from a company you’ve never heard of, is probably not legit. Ask your web designer/developer about it if you’re not sure what to do. Have you received similar letters in the mail? Please share your experience here in the comments. Your experience could help someone else.